We’d love your help. Let us know what’s wrong with this preview of Blue Thunder by Bob Plamondon. To ask other readers questions about Blue Thunder, please sign up. As a trained historian who won a MA in Canadian history, I highly recommend this book as well-documented history by an excellent writer. Mr. Plamondon recounts the stories of many of Canada's greatest Prime Ministers from as balanced a perspective as most human beings could do. Canadians and those who would like to learn more about our great country and the approaches of proven great leaders in complex and difficult situations will find this book fact-filled, and fun! 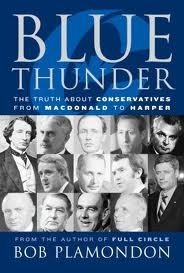 Excellent history of a political party and a mixed lot of Canadian prime ministers. The first one--John A. Macdonald--turns out to have been the best.